I've had a fairly busy Summer. Not as much birding as I'd like, but yesterday I got to get away for the day run down to Madera Canyon in Pima County, south of Tucson. 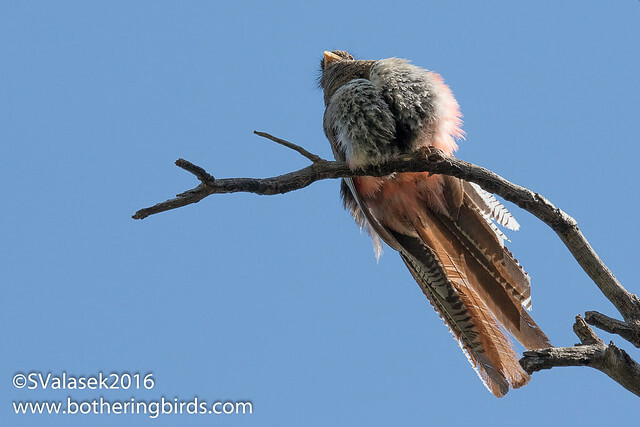 I've been there 3 times before looking for Elegant Trogons to no avail. But I've always been there later in the day. But I was up at at 3am for some reason, an hour earlier than my alarm even, so I got my gear together and hit the road. I still didn't get there until after the Sun was up. 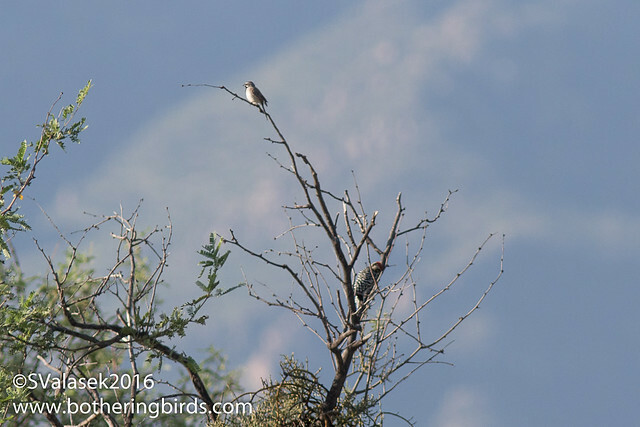 I noticed a few birds along the road leading to Madera Canyon, so I stopped for a few minutes to see if a Black-Chinned Sparrow would appear, or better yet, a Five-Striped Sparrow. 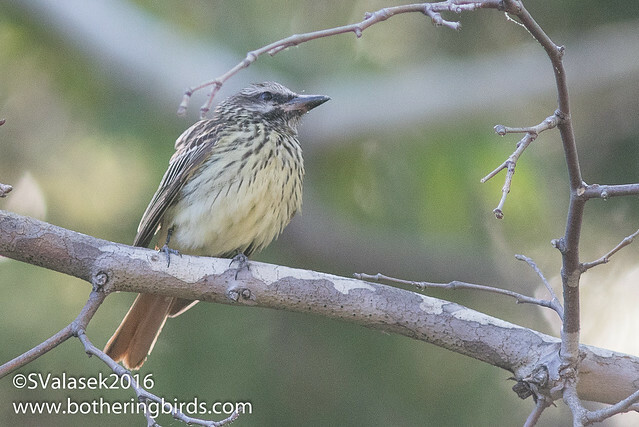 But none of those were around, but I got to see a bunch of Cactus Wrens on the back-lit side of the road and a Black-Throated Sparrow and Ladder-Backed Woodpecker on the side with better light. I continued into the canyon and drove past the various lodges until I reached the end and trailhead for the Carrie Nation Trail. I made a quick detour across the stream to check on the Pygmy Owl nest that I saw on my last trip, but it appeared empty. 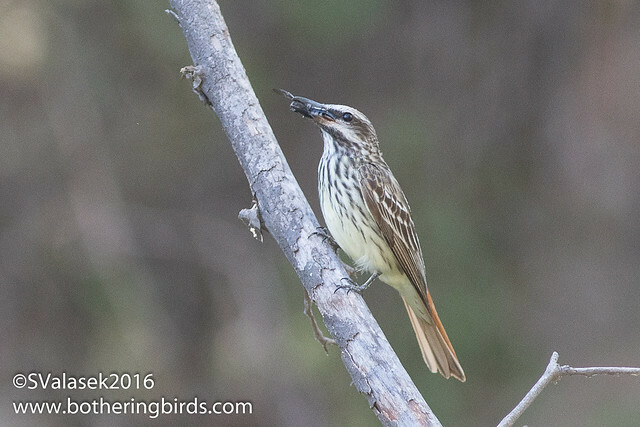 All this time I was surrounded by the dog-toy squeaks of Sulphur-Bellied Flycatchers. There were a half-dozen or so and a few of them seemed to be juveniles. I crossed back over to the main trail and continued on my way. 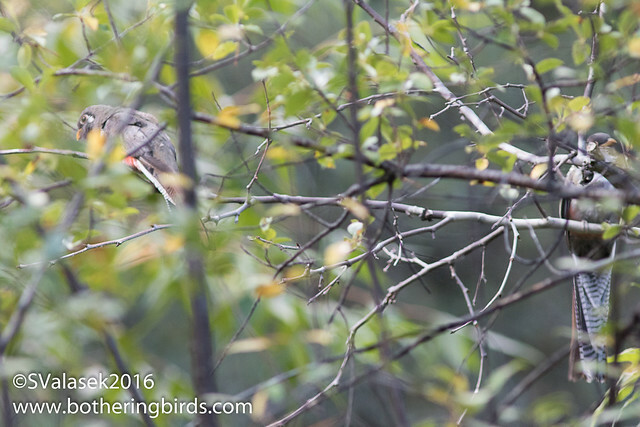 I knew that some Trogons were recently reported where the trail crossed the stream, a few hundred feet further up. 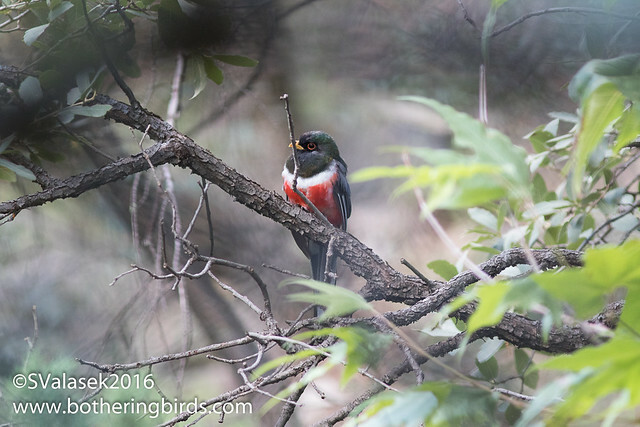 I didn't get too far before I ran into a trio of birders coming down and I asked them if they had seen any Elegant Trogons. They said yes, and pointed over my head! Finally, after 8 or 10 different visits looking them, one was right over my head. And then I saw another one fly in next to the first. They both quickly flew back up the trail. One of the birders ended up being from Pittsburgh and out for the week with his wife, who was further up the trail. He had a canon 500mm and offered to let me put my 7d mkII body on it for a few shots. The angle wasn't the best, but wow, what a difference over my 300mm. We followed the Trogons as they continued back up the trail. It appeared like they were gleaning insects off of leaves. They would fly up to the ends of leaves, stop in mid-air, and then continue on a bit to a roost. It was amazing the looks that we were getting. 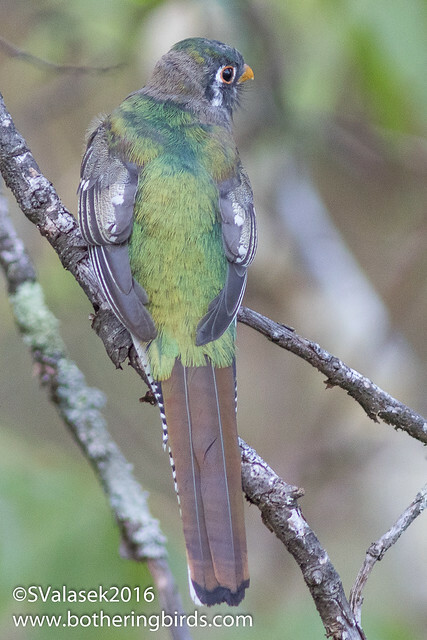 Even better than a pair of Elegant Trogons are three of them. Near this male were 2 together on a branch. What an experience. 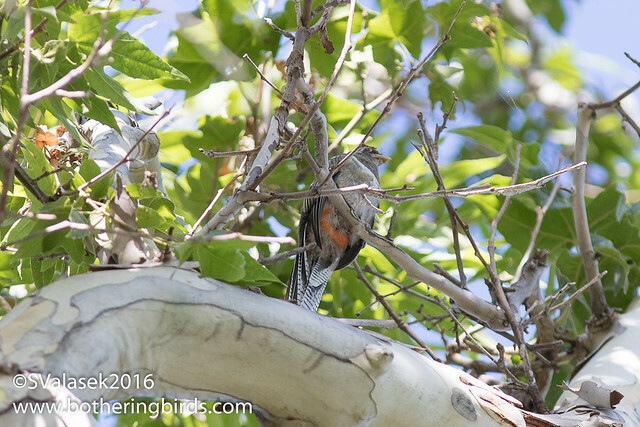 These are some great looking birds and with their greens and reddish-pink colors. I'm still on a rush after finally seeing these birds. And I have some more photos on my Flickr page. 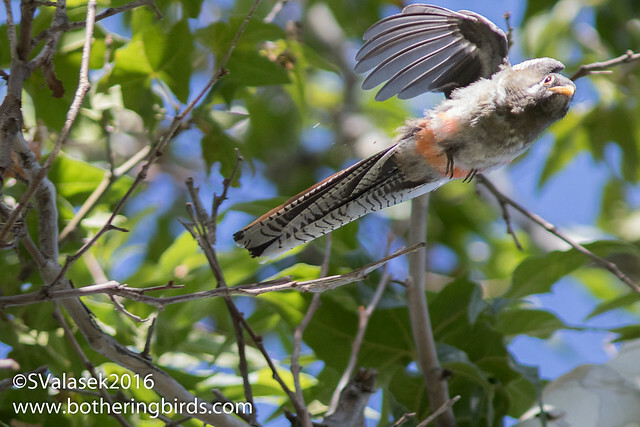 I wasn't done with Madera Canyon, the real reason that I drove down to Madera Canyon was to twitch a hummingbird. But I'll post those photos in a separate blog post.